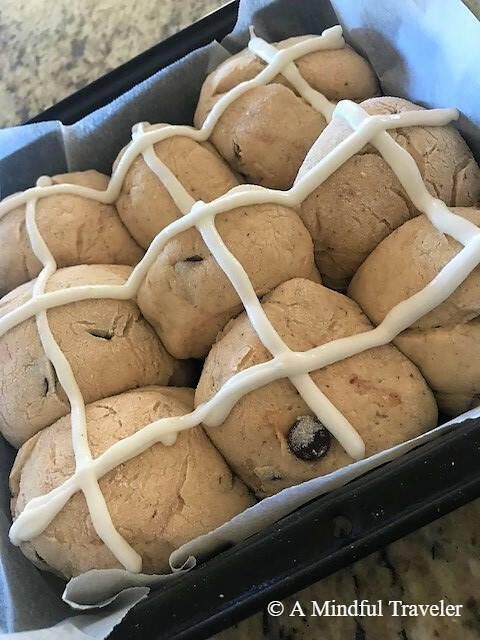 As we celebrate Easter this week, enjoy these delicious gluten free hot cross buns. 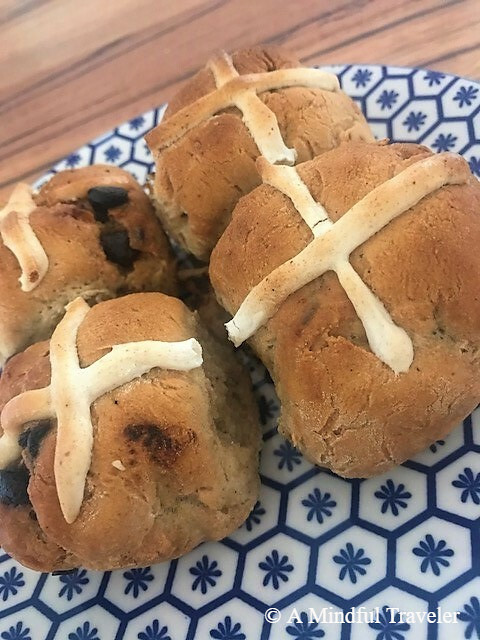 I like to add choc chips in mine, but feel free to omit these and substitute with sultanas, for a more traditional hot cross bun. Place yeast, sugar, and milk in a small bowl. Set aside in a warm place for 10 minutes or until frothy. Combine gluten-free flour and spices in a bowl. Rub in the softened butter with fingertips. Add chocolate chips. Make a well in the centre of the dry ingredients. Add yeast mixture, vanilla, and egg. Mix until a sticky dough forms. Knead the dough on a lightly floured surface for 5 minutes. Place dough back in the bowl and cover with a tea towel or cling wrap, and set aside in a warm place for 1 hour or until doubled in size. Divide dough into equal portions and roll each into a ball. Place into a square tin lined with baking paper. Cover once more and set aside for another 10 minutes in a warm place. Place extra flour and 2 teaspoons of extra sugar in a small bowl. Stir in 2 tablespoons cold water to form a thick, smooth paste. Place paste in a plastic ziplock bag and snip off one corner. Pipe crosses over the buns and bake for 20 minutes or until brown. Cool on wire rack. While the hot cross buns are baking, make the glaze. Place the water in a small bowl and sprinkle the gelatin on top. Leave for 1 to 2 minutes or until the gelatin is dissolved. Place the sugar and extra water in a small saucepan over a low heat. Stir until sugar is dissolved. Add the gelatine mixture and whisk for 1 to 2 minutes. Using a pastry brush, apply the glaze over the warm hot cross buns and serve. Hot crossed buns make me nostalgic for the time I used to make them at my Granny’s house! We always put raisins in them. I had never even heard of hot crossed buns with chocolate chips until your post! I do love chocolate, but I think I’ll stick with raisins in this case. Wonderful delicious looking recipe! We have some relatives who are gluten sensitive and this will be perfect for them. Thanks for sharing! Ahhh, yes, good ol’ nursery rhymes….. one a penny, two a penny…..
Gorgeous! I love gluten free bakings too. They make you less bloated. Thank you for this Easter recipe! They look so delicious. Thanks for sharing your recipe. I love hot cross buns. This recipe sounds good. These look so good. The last set of gluten free Hot Cross Buns I tried were all crumbly. Gotta find a nice set. Ohmygoodness these look gorgeous. Because of Crohn’s I try to avoid gluten because it tends to make me quite ill, but I could see it would be easy to make these lactose free as well so it’d be one of the only things I could eat that doesn’t make me extremely ill lmao. I’d definitely love to give these a try. Another grear recipe! Choc chips is a great idea here. I make our own gluten-free bread 2-3 times a week, but have never tried anything like this. Maybe I will! Yum! Looks so good! Hope you had a wonderful Easter weekend! mmm…I’ve never had any, so I’m looking forward to trying out this recipe. Thanks for this recipe! I look forward to making it! Always looking for good GF recipes, especially with bread, for I miss warm fresh bread!! I understand. Being off bread is really hard. I love my breads too much! Timely post Lorelle. I was warned off gluten by my Dr only yesterday (bad psoriasis flare up, and now seemly psoriatic arthritis). I know Naturapaths always sway away from Gluten, but not wanting to become yet another ‘faddie foodie,’I’ve never gone down that road. I have a lot of respect for my GP though, so I think I’ll be giving it a go. 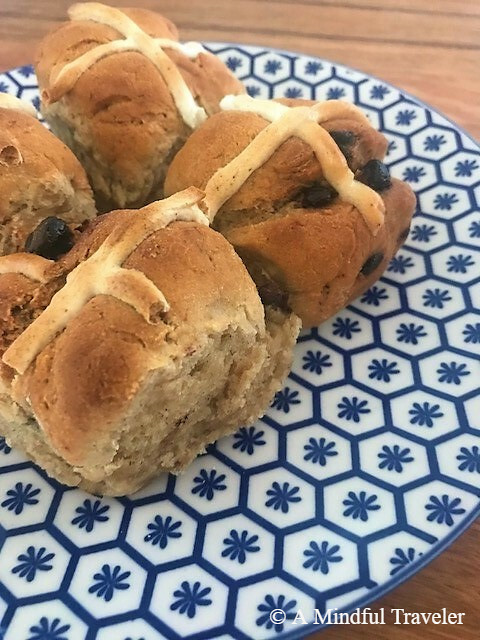 It’s only reading this post of yours that I realised Easter’s on the way – and I absolutely love hot cross buns,definitely sultanas though, no choc chips! Thank you for the recipe. Oh no Chris. It’s such a common issue. I tried this recipe over a year ago when my daughter was trialing a GF diet. She loved them so much, I still make them now even though she can still have gluten.